Robin McKinley has written two rather different adaptations of Beauty and the Beast; this is the second, and perhaps more sophisticated one. There’s much more magic in this one, and more of a developed fantasy world for the story to take place in. It also departs from the basic story much more, introducing additional characters and motivations. While it makes for a much more rounded world, I found myself much less interested in it! Sometimes simplicity can work better, and this ended up feeling rather fussy to me. The whole tangle has to be explained at the end by a character who has barely previously appeared, and that also feels clumsy. There is one aspect of this I prefer to other tellings, and that’s the fact that the Beast remains a Beast. The transformation to a man seems weird sometimes — or rather, the transformation to a man followed by an immediate marriage, especially when Beauty is described as being confused by and even timid by her transformed partner. It seems to make more sense this way, at least for this particular version of the story. In any case, I’m glad I reread this, but I probably won’t do so again. I far prefer McKinley’s first version, Beauty! I don’t know why I keep coming back to this book — one I originally gave just three stars — but I think this is probably the fourth time I’ve read it. This time, because I saw a copy for three euros in Dublin and just had to, had to, had to; up to now, I didn’t actually have my own copy, which you can imagine was annoying and of course I had to rectify it. I think the thing is, it’s such a warm story. Mirasol and the Master’s relationship is so tentative, so careful; their attempts to reach out to the land they’re bound to and heal the things that have happened are so conscientious, untutored, sometimes even desperate, and yet they never give up. And I love all the domestic details: the honey, the woodrights, all the sensory stuff that comes with the honey… And the idea of the Chalice, both the office and the object, her duty to bind the Circle and all the little details of how to do that. I also think it’s a very hopeful book, in the same sort of way as The Goblin Emperor or Uprooted, other books I’ve liked more recently. Okay, there is a conflict, but the outcome is almost totally positive, and the main characters seek as much as they can to avoid conflict. It’s gentle, calm, and thus calming. I imagine I’ll reread it again sometime in the future. This week’s theme is books you’d like to see as movies/tv shows. The proviso here is that I would want appropriate casting, e.g. not a white man for Ged or Patriot. A Wizard of Earthsea, Ursula Le Guin. Shush. There hasn’t been one. Doesn’t exist. Captain Marvel. Sooner than planned, please. And keep in the recent bit about her dating Rhodey! Young Avengers. You’ve got all the ingredients ready, Marvel. Dooo iiiiiittttt. Throne of Glass, Sarah J. Maas. It could be really epic, and it’d require a female lead who could do stunts and would need a good range of acting skills. A Natural History of Dragons, Mary Brennan. I’m not sure how well it’d translate to the big screen, but again, it’d require a female lead and it’d be a little bit like Walking With Dinosaurs, only dragons and fiction. The Winter King, Bernard Cornwell. Do Arthur right! Tigana, Guy Gavriel Kay. In the right hands, it would be beautiful. Sunshine, Robin McKinley. Female lead who is both a reluctant hero type and a baker. Interesting vampire lore, gorgeous imagery. It’d be amazing, right? Farthing, Jo Walton. Could serve as a timely warning to a country embracing conservatism right now, too. Bloodshot, Cherie Priest. Weird found-family dynamics, kickass female lead, ex-Navy SEAL drag queen? Okay, there’d be so many ways for them to mess it up, but we’re talking an ideal world here, and it would be so very right. This week’s Top Ten Tuesday is “Top Ten Books Which Feature Characters Who _____”. So, because I’m predictable like that, let’s have my top ten characters who love books! Matilda, from Roald Dahl’s Matilda. I don’t know about anyone else, but I used to sit and stare at things and wish I could have powers like Matilda. But even better would’ve been to read as fast as her. Mori, from Jo Walton’s Among Others. I think this one is extra-specially predictable. Shush. Hermione Granger, from J.K. Rowling’s Harry Potter. I’m in the middle of my rereads of these books and remembering just how much I loved Hermione — I was that know-it-all who sucked up to the teachers, though I didn’t have such good and loyal friends as Harry and Ron surrounding me. And unfortunately, I still didn’t have powers. Cath, from Rainbow Rowell’s Fangirl. Why is this list so populated with people like me…? Harriet Vane, from Dorothy L. Sayers’ Wimsey mysteries. Well, she’s more of a writer and we don’t see her reading much, but we do see her engaging with literature, and practically sparring with Peter via quotations from books. Beauty, in Robin McKinley’s Beauty. Gimme the Beast’s library, please. Jean, from Scott Lynch’s The Lies of Locke Lamora. Jean! Memer, from Ursula Le Guin’s Voices. I need to reread this one now I’ve remembered about it! Jo March, from Louisa May Alcott’s Little Women. I think I actually came across Jo and Matilda not that far apart in time. Both of them lived in a world of books that only encouraged me to read more! That was actually harder than I anticipated. Huh. Looking forward to seeing what themes other people are going with! Yeine, from The Hundred Thousand Kingdoms by N.K. Jemisin. Seriously, seriously kickass lady who navigates politics, would prefer a fair fight, and becomes a goddess. Why not? Tenar, from The Tombs of Atuan by Ursula Le Guin. That was always my favourite book of the bunch. I can’t quite put my finger on why, but Tenar is strong in a way that has nothing to do with physical strength. Mori, from Among Others by Jo Walton. Because she’s quite a lot like me, only she really can see fairies and she has a streak of pragmatism I could really use. Harriet Vane, from the Lord Peter Wimsey mysteries by Dorothy L. Sayers. Bit of a change of pace from the first three, being a different genre. But she’s a woman in a man’s world, pursuing both writing and academia, a strong woman who knows her own mind and sticks to her principles. But at the same time, she’s not perfect: she snarls at Peter, she’s unfair, etc, etc. Phèdre nó Delaunay de Montrève, from Kushiel’s Dart by Jacqueline Carey. If there’s anything that can hold her back, I don’t know what it is. She’s gorgeous, she’s a spy, she manipulates politics and gets involved in all kinds of stuff on behalf of her country. Katherine Talbert, from The Privilege of the Sword by Ellen Kushner. Even if she doesn’t want to learn to fight at first. Ki, from Harpy’s Flight by Megan Lindholm. Practical, determined, fierce, and good to her animals, to her friends. Caitrin, from Heart’s Blood by Juliet Marillier. She doesn’t seem like she’s going to be a strong person at first, yet she learns to face her fears — without it ever seeming too easy. Mirasol, from Chalice by Robin McKinley. She’s thrown in at the deep end, with very little gratefulness or support from those around her, and she pushes through it to do whatever she has to do. Csethiro Celedin, from The Goblin Emperor by Katherine Addison. She basically says that if anyone hurts Maia she’ll duel them and gut them. Like! I’m gonna have to look at loads of posts on this one, because stories with good heroines are definitely of interest to me! Wow, I don’t know why I didn’t really like The Hero and the Crown very much on the first go round. It’s full of all the kinds of things I love: love stories that aren’t just simple love-at-first-sight or we-grew-up-together-and-now-we’re-in-love, but something more complicated that that; a world with a history and a future, outside of what we’ve got; a heroine who works through flaws and barriers to become a hero. And the last sentences — ach! Lovely. 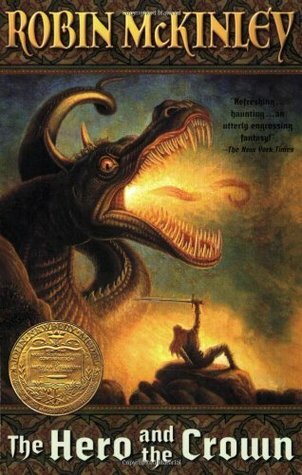 It’s not some straightforward children’s story in which a heroine goes forth and slays a dragon. That happens, but it happens as part of a longer journey: the dragon isn’t the end, but only really the beginning of Aerin’s journey. It doesn’t solve all her issues and let her go home unscathed, unchanged, to a court that’s suddenly ready to accept her. Aerin’s story is harder than that. Looking at my old review/notes on this, I was disappointed by the worldbuilding — which I think is funny, because though it’s subtle, there’s plenty here. The surka, the crown, old heroes, Luthe’s background, why the animals follow Aerin: there’s so much that doesn’t get elucidated, but remains there for you to turn over and wonder at. 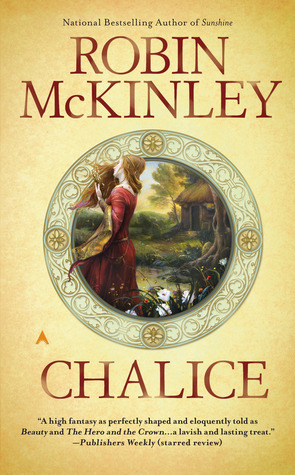 McKinley doesn’t give you all the answers about her world in one go, and I doubt that The Blue Sword will answer all of it either. Maybe you have to do a little more work to really appreciate the history of the world, because McKinley does nothing so clumsy as sit you in a history lesson with Aerin to learn about it. Overall, given the subtlety of parts of this and the wistfulness of the love stories, I’m not entirely sure how I’d have taken this as a child. It may be a prime example of a story that works on two levels: Aerin waving her sword around for younger readers, winning the day with her prowess, while the older readers might taste more of the bittersweetness of her immortality and her twin-nature. Reread of The Hero and the Crown (Robin McKinley) — I’ve been needing familiar things. I need to finish The Just City (Jo Walton); it’s on my bedside table, but I haven’t wanted to be venturesome the last couple weeks. Not a good brain-week, this. I’ll finish up The Just City (Jo Walton) and Shadows (Robin McKinley), and then I want to get round to rereading Heart’s Blood (Juliet Marillier), before I lose the thread of my Beauty and the Beast themed reading.